Considered as one of the oldest kinds of textile arts, hand sewing started during the Paleolithic Age, when Stone Age people made clothes out of fur and skin. We published an article recently tracing the origins of sewing back over 25,000 years to the very beginning. In another of our recent articles examined the sewing revolution and how sewing has changed since the invention of the sewing machine and the ready-to-wear clothing market to the present day. In this article we look at the time in between, when complex and beautiful garments we constructed by hand often over weeks and months of painstaking effort and what of that art still exists today in the form of the Haute Couture fashion industry. Hand sewing became a popular art and craft for thousands of years largely until the invention of the sewing machine in the 1900’s. The late part of the 20th century witnessed the mass production of machine sewn objects and consequently, there was a decline in the production of hand-sewn garments. 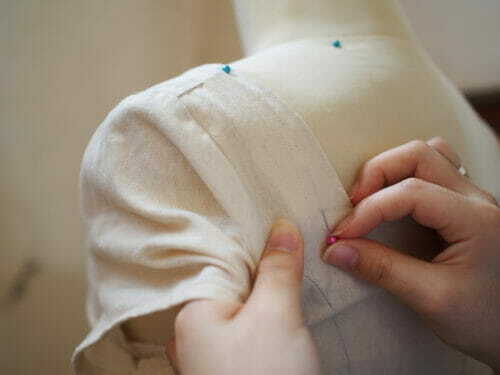 Today, hand sewing is mostly done only for high-quality tailoring and Haute Couture fashion. It is also still alive among textile artists and hobbyists who express their art through hand sewing. And it is Haute Couture that is considered as a truly fine art. Literally, Haute Couture in French translates to “sewing at a high level”. Charles Frederick Worth, the Father of Haute Couture lived during the reign of Napoleon III in the 19th Century, and Empress Eugenie was one of his high-end clients. He used only the finest fabrics like muslin or toile, which are mostly made of natural fiber. Tailored fit to individual customers, Worth’s garments used fabrics pieced for design and they were mostly sewn by hand. Everett Historical / Shutterstock.comImagine sewing a 19th Century gown completely by your own hands! Think of the time and effort it would take. Hand sewing, however, was the standard then because there was still no sewing machine at that time. And today, couture artists still prefer hand sewing because of its precision and delicacy as opposed to sewing by machine. Using historical stitches and fine fabrics, couture artists hand sew and piece together garments to create that special historical or exclusive look. 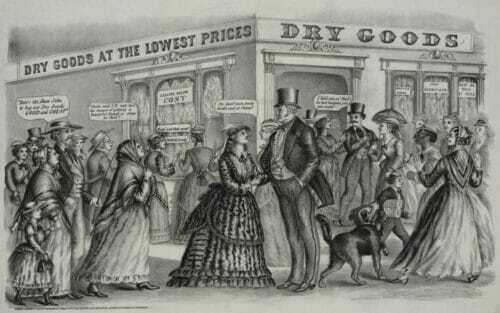 Because fabrics were prohibitively expensive in the old days, garments were pieced together to economize. Labor, on the other hand, was cheap, so every bit of fabric was used and practically nothing was wasted. Collars for gentlemen’s coats were pieced at the corner and sleeves and trims were pieced to the ladies’ gowns. The construction of garments also involved piecing where stripes were cut, rearranged or re-seamed, and small pieces added to produce a new look. The result is a unique and pleasing aesthetic that is characteristic of the Old World fashion style. Although hand sewing garments is nowhere near as popular as ages ago, a select group of fashion designers invites fashion editors, celebrities and members of the super-rich to a week-long fashion show in Paris to showcase their Haute Couture collections. These clothes cost from $25,000 to a million and can take as long as 700 hours of hand sewing, embellishing, bedecking and embroidering to create. Characterized by lavish fabrics, historic dressmaking and precise tailoring, the presentation of Haute Couture collections are important events in the fashion industry. And it is the Chambre Syndicale de la Haute Couture in Paris that gives permission to label collections as such. Haute Couture, however, suffers from a diminishing clientele largely because of its exorbitant prices. Over the past century, the number of couture houses has already declined significantly. Does this mean that we are losing the art of hand sewing? There is a small group of hand sewists who are giving the art a revival of sorts and hopefully, their tribe will increase. 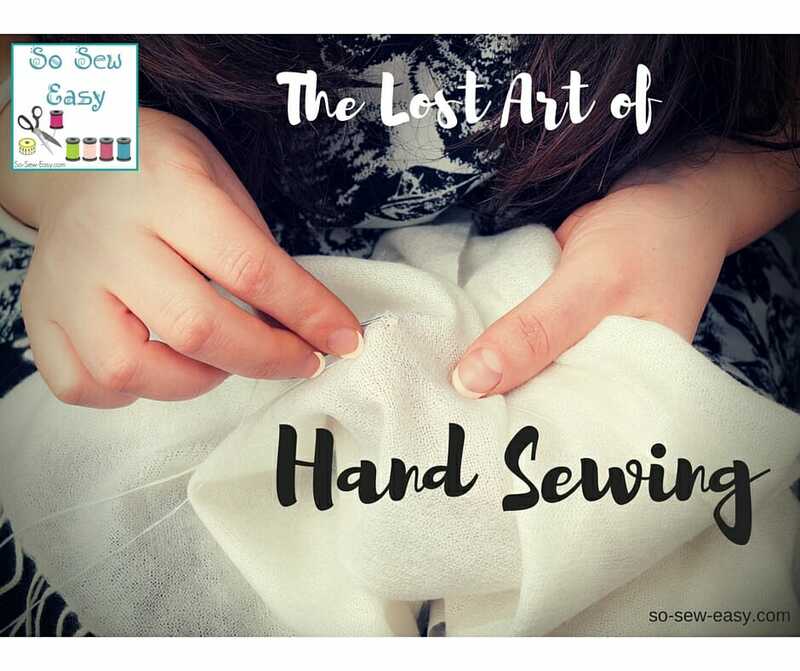 And because of them, we cannot definitely say that hand sewing is a lost art. Do you still practice hand sewing? Please share your experiences in the comments below. I make clothes from many historical periods and sew most all of them by hand. I recently finished an 18th century Italian gown and all the underpinnings which I wore at Costume College in Los Angeles in July. This included the chemise or shift, a pair of stays (corset in later years), two petticoats and a false rump to get the correct silhouette. The hardest part of all this is fitting things correctly – the stitching itself is pretty easy. After 12 years of making historical clothing by hand my stitches have become tiny and regular and there are a lot of choices depending on what is being sewn. I’ve learned so much about seam finishes and stitches for many applications that I feel I should teach it. Hand sewing is definitely not a lost art in the world of costuming. I love it. WOW Leslee, I can only imagine, it would be a privilege to see this in action. Have you made a video or documented it somehow? I want to learn to sew by hand and make my own clothing. I like the older styles of clothing to begin with and you can’t find it in stores. Would love to find someone to help teach me. Is there a decent affordable pattern for a nice looking chemise? Every Autumn, I have the sewing club at school begin the school year hand sewing Christmas ornaments for our annual fundraiser. They learn stitches such as blanket, back stitch, lazy daisy, french/colonial knots and more. Some really take to the idea and continue building on these basics throughout the year. Others prefer the machines but they at least have a basic knowledge they can use later in life to hem pants or sew on a button. I have only been sewing for about 4 years and right now I am just hand sewing the yoke and under collar on my shirts that I make. And closing the lining on my waistcoats. My hand sewing is improving but I know I have a ways to go. I am in awe of the Quilt, Glenda, I would like at some point to attempt a quilt like that, but, would not know where to start. Do you have any book recommendations for hand sewing skills, Mayra? I do most mending by hand. I make cloth dolls and clothes entirely by hand. There are many components that could be done by machine , eg straight seams, but hand sewing is good for the soul. Love my sewing machine too. My skills are quite mediocre because I see how much better I could be. People are VERY impressed by my hand sewing skills. That is sad because it means they cannot sew, or barely. Every child should be taught basic mending, sewing a straight even line, Fixing a hem, replacing a button. Like cooking an egg. Checking tire pressure. Just a basic life skill. When I make clothing, I use it for hems, etc., but I mainly use it in piecing quilts. Of course, most of my quilts are machine sewn, but I also hand applique, and I always have a hand sewing quilt going, too. I keep a small bag of it so that it is always ready to go – sewing while waiting (dr. office, meetings, etc. ), and also while watching tv with my husband. You can get a lot done that way! 🙂 Additionally, it is soooooo much easier to sew unusual seams by hand – “y” seams and curves both go together easily when sewn by hand. I do not do English Paper Piecing, but rather I use my hand sewing method for those patterns so that I do not need papers to sew around. My hand sewing is quite fine, so stitches never show on the front. Basically, I love it! :). I will try to attach a picture of one of my hand sewn quilts. Goodness me Glenda! What an astonishing piece of art. I would hang this on the wall for all to see! Bless your hangs! Thank you for sharing! Really gorgeous Glenda! I aspire to create like that someday, I love your suggestions, thank you. I prefer hand sewing although I’m not that good at it, I find it peaceful to sew by hand. It would be nice to learn how to make a hand rolled hem, incase the electricity goes out and I can not use my Brother serger. I started hand sewing when I was about 10. I got really big into it when my granddaughter was born and I joined the Smocking Arts Guild of America and got into French hand sewing baby garments. I love hand embroidery and hand rolled hems. I find hand sewing peaceful and relaxing and I do knitting. Only hand sewing I do are hems and sewing on buttons. Everything else is by machine. I’m trying to learn now. My grandmother taught me how to embroider when I was little, but that was a long time ago. I hand sew a great deal, have made several hand stitched cathedral window bedspreads, much lingerie and prefer to hand finish items when I do machine sew. I taught myself to hand sew when I was 5 a d still fi d it relaxing 35 years later. I wasn’t aloud at a machine, treadle, till it was 9. I still do a lot of hand work. I hand quilt everything. I hand baste all my work. Hand stitch zippers and hems. I have made complete outfits and quilts by hand over the years. I made a queen size hexagon quilt all hand pieces and quilted. Took 2 years. I have always believed hand stitching is the first thing one should learn and no is what I have taught any students I have had. They don’t see the point till I tell them that it is the only way to fix something when it rips out in public. I was fortunate to have over 5 generations of seamstresses to raise me. My great great grandmother even sewed for queen victoriana. I love to embroidery, and I find it very relaxing. My mother made quilts, and she hand quilted everything. She had a large hoop that she held on her lap for the quilting.I am interested in hand sewing and I’ve done a few small things. I hate sewing machines. I don’t think it’s truly art when an electrical machine is involved. Art takes time. My mother had sewing skills. She mastered the sewing machine. However, when my son was born she made him a blanket and matching hat, all by hand. It had the tiniest, most even stitches. And it had lace trim all around both items. I am a novice at sewing in general, but have been doing it by hand. I have sewn one toddler quilt (pieced and quilted by hand), a toddler skirt, a skirt for myself, and a sleeveless shirt. It is relaxing and it feels like such an accomplishment when I finished. I recently broke my hip so cannot sit at my sewing machine & have been hand sewing instead. I am usually very end product focused & find hand sewing very relaxing. I have discovered the addictive world of hexies, made a rabbit toy and started a felt quiet book. As I will be off work for a few weeks I am planning to make a completely hand made blouse from some Liberty fabric I have been hoarding. I am developing my patience and tougher finger tips!✂️? Thanks, for your article. It is good to know the importance of sewing things by hand. I had learned machine sewing from my mom in the 60’s and made a lot of my own clothes through the 80’s. I did not know the satisfaction of hand sewing until I started learning hand quilting in 2001 while living in Oklahoma. Today I belong to a quilt guild and enjoy both hand and machine quilting. Of lately, I have been doing patchwork soft jewelry broaches with hand sewn beading…..and to my surprise, have currently won ribbons at my county fair. So I would like to encourage anyone thinking about hand sewing to go for it. I am at 66 years and enjoying what I do. Hi Sandy, thanks for sharing. I too enjoy hand sewing although I certainly end up doing most by machine these days. Did lots of embellishments by hand about 20 years ago and this past year did hand-sewing for grand-daughter’s christening gown and a few special garments. Currently making yo-yos (Suffolk puffs) whenever I’m riding in a car and plan several projects after I get hundreds of them made. Hi Marty, thanks for sharing your experiences with hand sewing. Kind regards. When my grandmother taught me to sew (more than 50 yrs ago) I had to be able to sew a blouse by hand, to her standards, before she would even let me even sit at her machine, which was a treadle machine then. I was 8. I have always been glad that I learned this fine art. I still hand stitch lots of things, like the linings of garments. I find hand stitching to be very relaxing and just gives me a sense of having a well finished item. Even if I machine quilt, I will sew the bindings on by hand. I wish more of the newer sewing crowd would take the time to learn how hand stitch. Hi Joanne. Thanks so much for sharing your wonderful story. I do embroidery, have just started stumpwork and finish off garments that I made with my sewing machine. I hand quilt all of my quilts. So relaxing and satisfying. Wow! You are amazing! Keeping true to the art form of quilting. I admire your determination. I still do a lot of hand sewing, both construction and embellishments. As a retired seamstress, hand sewing relaxes me and gives great satisfaction. This is so true, very relaxing. I would love to see what you make. My mother taught me how to hand sew, and I still sew small things. I don’t have much experience using sewing machines since the last time I used one was almost 10 years ago, and it was an old Singer that was still human powered, so those really modern ones that are being sold now would probably confuse me too much. Mostly I just fix things, but I’m planning on making a small doll once summer vacation starts. Hi Genesis, thanks for sharing your experiences. I started hand sewing with a friend that wanted me to hand sew a the same quilt she was sewing by hand.Once I started I just loved sewing by hand. I have a hard time siting at a sewing machine because of a bad back. I finished the quilt. It was my first quilt and I got 2nd place ribbon at our quilt guild show. I am teaching my granddaughters to sew by hand. Hi Linda, thanks for sharing your experiences.